Games targeting healthy behaviors are proliferating. A study published in the Archives of Pediatrics & Adolescent Medicine found that children who played a health game were significantly more likely to select and eat healthier foods than kids who played a game without healthy-stimuli. What else does gaming bring that might also be new and important in the fight against childhood obesity? Gaming may make it a little more fun. How can something as seemingly trivial as games improve children's eating habits and, consequently, their health? Nutrition in and of itself is boring to children. While gaming is fun, exciting, and addicting. So applying gaming theory to nutrition education in the form of online games and mobile apps enables us to capture children's imaginations and engage them in learning as they play. There is much hope for health games as a tool to prevent obesity in children. A study conducted by Baylor College of Medicine in Houston, TX, showed playing games produced positive results in the areas of dietary change and physical activity among youths. First Lady Michelle Obama's Let's Move campaign and the USDA kicked off the Apps for Healthy Kids challenge. Offering $60,000.00 in prizes, they challenged software developers, game designers, students, and others to develop fun and engaging software tools and games that drive children to eat better and be more physically active. See all of the winning games in the Apps for Healthy Kids challenge. 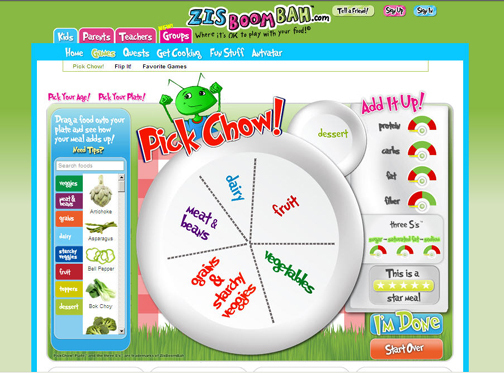 ZisBoomBah offers online educational games to help children and parents learn about food in a fun way. Taking first place in Michele Obama's Apps for Healthy Kids Contest, "Pick Chow!" allows children to create meals by dragging and dropping foods onto their virtual plate. The "Add it Up!" meters show the nutritional values in a fun and easy way and rates each meal with one to five stars - a feature that helps children learn quickly how their choices make a difference in creating a well-balanced meal. Children can send their "chow" to their parents, who then receive an email with what their child has chosen to be a healthy choice for breakfast, lunch and dinner, along with the menu, recipe, shopping list and coupons. Changing any behavior requires an understanding of human psychology, specifically the benefits and barriers associated with a particular health behavior, for example weight-related behaviors. Game developers historically have studied human behavior and developed games based on their observations. Playing games meets enduring psychological needs; children and adults have been playing games since before written history. Gaming is founded on things like points, levels, challenges and leader boards in an effort to keep players playing the game by stimulating human behaviors such as reward, status, self-expression, and achievement. 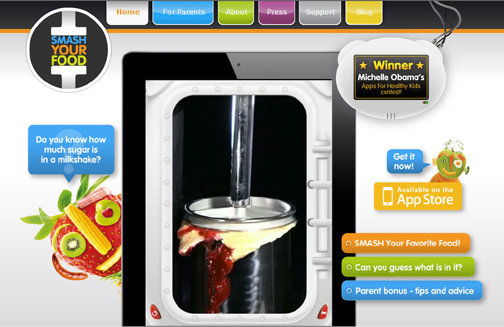 Smash Your Food is an app that allows children to see and hear foods like a milkshake, or a burger, explode - as they "smash their food!" _The game reveals how much sugar, salt and oil in 10 favorite foods (commonly abused by American children) that contribute to excessive calorie consumption and obesity._It received an honorable mention in Michelle Obama's Apps for Healthy Kids Contest. Childhood obesity is a significant problem, with 32% overweight or obese in the U.S.Prevention is key to combating obesity and necessitates unique strategies that engage children and can be implemented widely. The usual health curricular and behavior-change interventions targeted at children have had limited effectiveness. New channels are needed to reach children that offer promise of promoting substantial weight-related behavior changes. The novel approach of gaming to encourage healthy eating and activity holds strong hope for taming the obesity epidemic.